Beloved Spouse brought home two Snickers Peanut Butter Squareds Sunday night. Because he had been such a jerk on Sunday afternoon that one Snickers PBS was not going to get him back in my good graces the house. Actually, I was asleep when he got home, so he would have gotten in, even without candy bar tribute. But he didn’t know I would be asleep, so he is awarded the points. Anyway, I was eating one of my lovely Snickers PBS, and my eye fell on something printed on the wrapper. And I thought it was quite perceptive of the Snickers people to understand that their candy bars were likely to be bought in pairs as peace offerings to long-suffering wives from their jerky husbands. Although, while I appreciate the admonishment against gluttony, it’s not as if I were going to eat both of them at once. 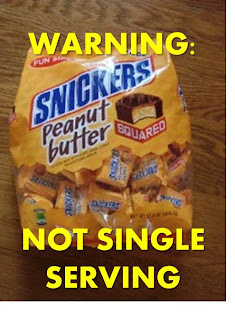 Snickers PBS are to be savored. Then I realized the wrapper was suggesting that I should save one square of one candy bar for later. I nearly snorted peanut butter out of my nose, I laughed so hard. No pun intended, but are you nuts, Snickers? Surely the only reason you made your PBS (which obviously stands for Perfectly Bitchin’ Snack) in two pieces was to maximize the surface area covered by chocolate. Surely you didn’t actually expect anyone, having eaten one, to not eat the other – or, even more ridiculously, to offer it to someone else? 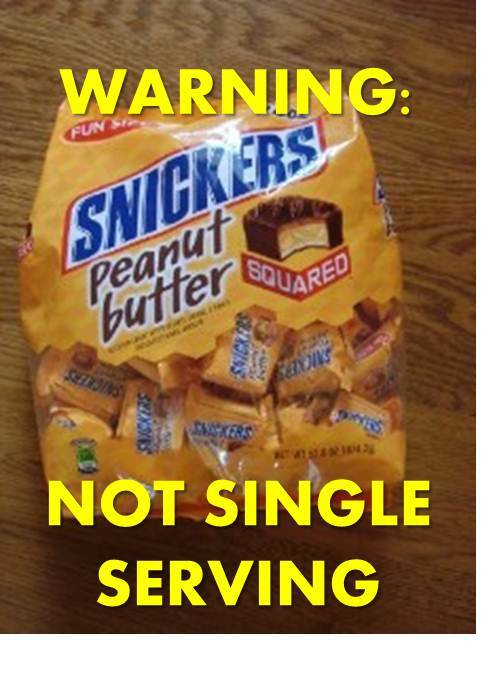 That’s a good one, Snickers. What’s next? Yeah, right. Next you'll be telling me pints of Ben & Jerry's aren't single serving, either. The only person I know who didn't inhale an entire chocolate bar in 5 seconds was my grandma...she'd eat half of one mini-bar and claim she was full. I assume she was insane.